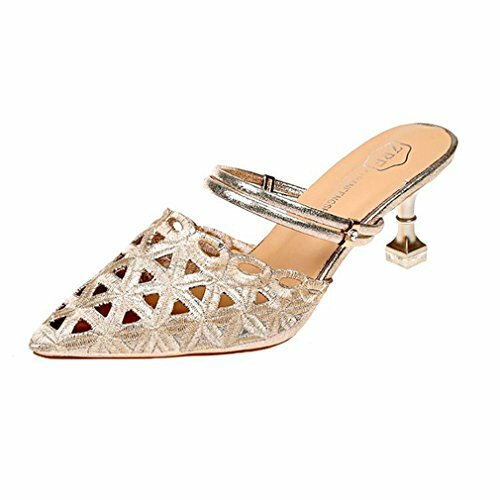 GIY Women's Fashion Clear Pearl High Heel Slide Sandals Open Toe Platform Fur Mule Dress Pump Wedge Sandal. NOTE: Please choose right size before ordering. Thank you! Proper measurements ensure a proper fit. Below size and foot length/foot width for your reference if not sure. EU35 = Size 4.5 US = 22.5cm/8.86"
EU36 = Size 5/5.5 US =23cm/9.06"
EU37 = Size 6 US =23.5cm/9.25"
EU38 = Size 7 US =24cm/9.45"
EU39 = Size 7.5/8 US =24.5cm/9.65"
Main Material: High Quality Synthetic Upper, Comfortable Microfiber Inside, Lightweight Durable Rubber Outsole. If you have any question, please feel free contact with us. Thank you! FEATURES: Special Design for Easy Slip-on/off with Unique Hollow Out/Strappy Embellished. EFFORTLESS STYLE & COMFORT: The Durable and Flexible Anti-slip Rubber Outsole Makes for A Comfortable Step & Breathable Microfiber Lining for Superior Comfort. OCCASION: Perfect For Wedding Party, Evening, Beach, Vacation, Street, Summer Dress Sandals & More. Best Gift for your Families and Friends.